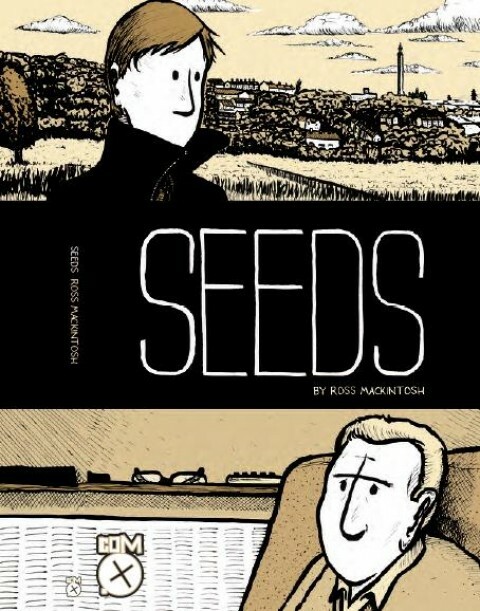 Seeds is Ross Mackintosh’s debut graphic novel, providing an autobiographical account of his Dad’s fatal battle with cancer. The beauty of Seeds is in its simplicity. Most pages follow the same six panelled format and the characters are depicted with only dots for eyes and a line for a nose. 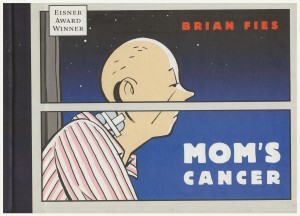 Although his father is arguably the centrepiece of the narrative, little detail about him is actually given, in keeping with the minimalistic artwork. However, through this style Mackintosh can ensure a very personal story is relatable and accessible to the masses. 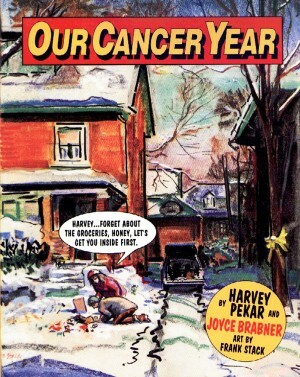 Despite the difficult subject matter, the graphic novel is full of heart and full of humour. One of its greatest achievements is the circularity of the narrative. Although simply structured the story jumps from present to past, depicted through the waved edged of the panel border for the past and straight line for present. The past scenes often centre around him and his father’s made up game of ‘spinnos.’ This begins in the past but by the conclusion is weaved into the narrative with Mackintosh passing the legacy onto his own child. By that conclusion, it is as if the readers too have been on a cathartic journey with the creator. 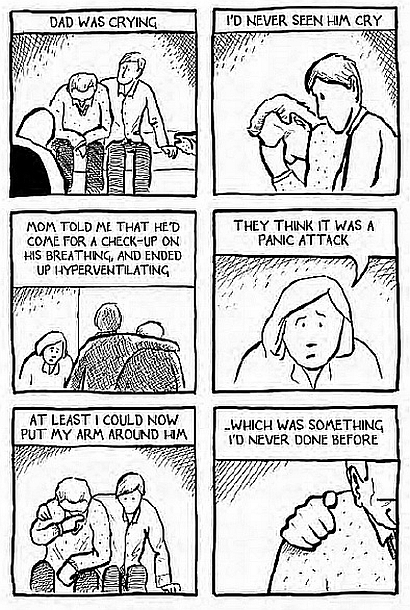 Throughout the graphic novel, Mackintosh has some serious and in-depth moments where he questions and addresses his own bereavement and existential concerns. At key moments, such as this, the format will often change subtly, such as the stretching of two panels into one, and because this occurs so rarely the change has an arguably more powerful and lasting effect. Despite the seemingly simple narrative, the story is filled with emotion and is an excellent example of the misleading simplicity of the comics format. Mackintosh uses various clever, understated techniques to enhance the storytelling and utilise the potential of the medium. Seeds is a short but incredibly moving and powerful autobiographical graphic novel that provides an insight into a very personal experience in Mackintosh’s life, but also operates more universally as a story about love and remembrance. 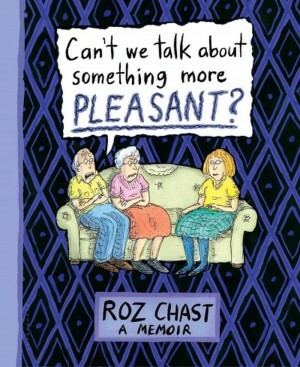 For those interested in the recent ‘graphic medicine’ genre, this is a worthy addition to your bookshelf and will leave readers considering the themes long after the book is put down.